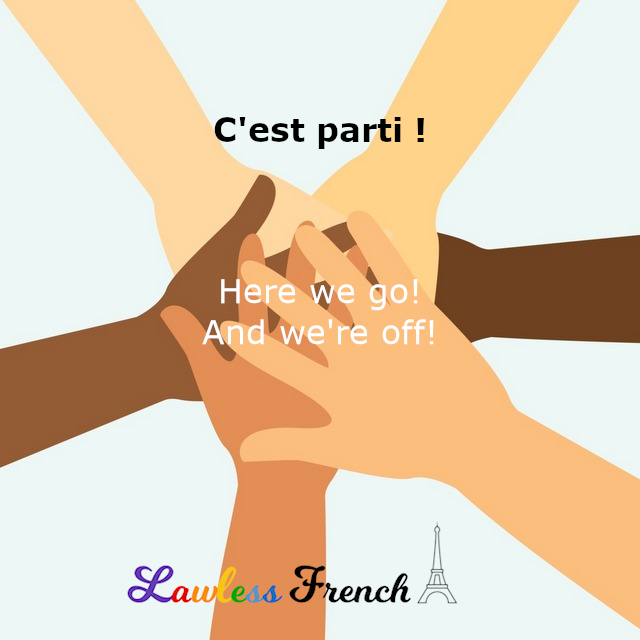 Usage notes: C’est parti is a very useful French expression that you can use any time something is starting to happen or is just about to happen, especially something that has been a long time coming. Les bagages sont dans le coffre ? Tout le monde est là ? Allez, c’est parti ! The luggage is in the trunk? Everyone’s here? OK, we’re off! Après 10 ans de recherche-développement, nous sommes fiers d’annoncer le lancement de notre nouveau gadget. C’est parti ! After 10 years of research and development, we are proud to announce the launch of our new widget. Here we go! Variation: C’est parti, mon kiki – Kiki literally means "throat," but here it doesn’t mean anything; it’s just a fun little addition, like "Let’s go, Daddy-O!" Thanks to google I am here and I read your post. I am a french speaker and I think your website is really great ! But I have to correct you about “kiki”, in french some people us it also for children to talk about their “willy”. (We have many different words for that but just to let know everybody ;-)). And at the time, it also meant a lover or a husband.